Even now, as I write this blog, I’ve responded to email, answered and made several calls, and worked on lesser priorities. Focus! C’est la vie! Right? No, it doesn’t have to be that way. As we go through life, much of our days are determined for us. Yet, each of us has the ability to focus on the priority at hand – to get a job done, work on an ongoing task, fulfill a promise. We should be determined to focus the time we call our own in such a way that a priority is prioritized. When I was young, my math grades, were… well, a challenge to my school teacher mother. I remember many an afternoon going over my “times” tables with Mom. 6×8 is 48, 6×8 is 48, 6×8 is 48. On and on we would go with my mother occasionally encouraging me to think! She would then punctuate each letter, T – H – I – N – K! While I’m no math genius, I know my “times” table and have instilled those same words into my children that my mother drilled into me, whether math facts or many of the myriad other knowledge bites we desire to pass along. T – H – I -N – K! Come to think about it (pun intended), that is the basis for keeping the main thing the main thing. Call it what you will – Focus, Priority, Keeping First Things First, each of us has to make a conscious decision on what to do with our most precious commodity. Time. Many books have been written on Time Management and Priorities. Our desire to end the day with a sense of accomplishment cries out to us. We want to be more efficient, more effective, get a job done. How can I squeeze more out of each minute and hour. Some people schedule their day into 10 or 15-minute increments. In fact, a recent article pointed to successful executives parsing their time into 5-minute work segments. Focus? This reminds me of a joke by the comedian, Brian Regan. While waxing eloquent on the packaging and instructions for the breakfast food, Pop Tarts, he joked that if you had to microwave your pastry for 3 seconds to get on your way that possibly you needed to free up your schedule a bit. What is your main thing? It changes. Patrick Lencioni writes in The 3 Big Questions for the Frantic Family: A Leadership Fable that family priorities change frequently, establishing a need to prioritize on the current need, which should be reviewed and revised at least quarterly. More frequently, if needed. One last thought… make finding Your Main Thing a habit and life may become more directed and focused. Your life. I’m not sure where I first heard the quote, “there is nothing more uncommon than common sense,” however, it has struck a chord with me the longer that I live. At first, I thought these words of wisdom were penned by Ben Franklin, one of the Founding Fathers of the United States, yet years’ later I find that the author was famed architect, Frank Lloyd Wright. Wright was an influential visionary of the 20th century, known to the casual observer as simply being an architect. To the discerning, Wright arranged open living spaces and used light and the influences of nature in his designs. His Prairie Houses, on the outskirts of Chicago, exhibited outward symmetry while the inside was asymmetrical with rooms integrating designs that used light to enhance the living space in a more natural setting. Possibly, the link between Franklin and Wright exists as both found ways to create complicated structures that allowed others to enjoy the simplicity of the design. 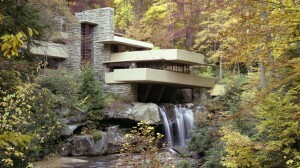 Wright’s Fallingwater house was a testament to the creation of a structure that made the most of its surroundings, where art complemented nature. Similarly, Franklin established early in life a set of 13 Virtues that were to govern his life and actions. He did well. Franklin’s list of achievements is long, here are a few highlights: Founding Father and signatory to both the U.S. Declaration of Independence and Constitution, 1st Postmaster, Ambassador to France, Pennsylvania Governer… and the list goes on. As an inventor, many adults owe their reading ability to Franklin, the designer of bifocals. Franklin set forth a set of virtues to define his character early in life, which complemented his life well-lived. So, what about common sense? Is the ability make wise decisions important? What about the understanding of surroundings so that sound judgment can be exercised? Look around, read the headlines, listen to the rancor in the media. Now, more than ever, we need the simplicity of common sense. Mr. Franklin and Mr. Wright, we applaud you and we need to emulate you.